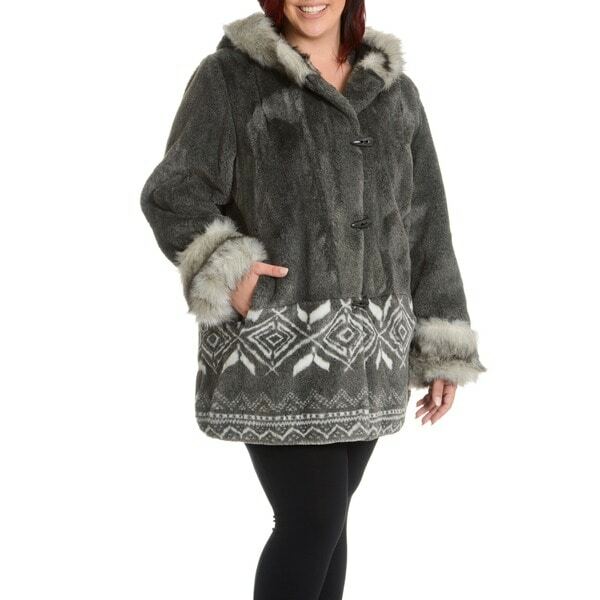 Can't say enough about this beautiful, warm coat. Love it. Excellent purchase! A timeless coat styled in faux fur. Toggle closures and two hidden front pockets keep you cozy in the frigid months. The approximate length from the top center back to the hem is 32 inches. The measurement was taken from a size 1X. A beautiful coat and I've had many people stop me and compliment me on it. Along with an almost guaranteed additional comment that it must be/looks warm. To which I always say it is. The size I got was the "large"/ a 3x. One thing to note to one and all, where the white/cream color looks exactly as it is pictured here, the grey is actually a lighter shade of grey that the near black it seems to be in the listing here. A minor consequence, but still, I do think worth noting. The faux fur is not real looking al all and it is around the bottom of the sleeves. This is a draw back but would not keep me from buying the coat at the half price or less. I would never pay the full price because it is not worth that. Coats are over priced. It is a pretty grey color and I like the hood. I fell in love with the photo of this coat. Searched and searched for a size Medium or Large - all that was available on Overstock was an XL. Finally gave in and ordered an XL, knowing it would be way big. It is - but not in a bad way. I can easily wear big bulky sweaters under it, and not feel the least bit cramped. I wanted this coat to have a "bundled up in a big warm fur throw" sort of feel, and it does. It is super warm - even in our recent temps of minus 20 F - I didn't feel even the slightest chill in this coat. I've also received lots of compliments on it from just random people, while walking through stores. Glad I ordered it, and not the least bit disappointed in it being a size or two too large. My husband gave me a coat just like this for Christmas this year. I loved it. It's so soft and fit perfectly. Felt wonderful on. Made me feel elegant. The sleeves fold up so they will fit anyone perfectly. only got to wear it that day. On the way home that evening, My coat was ruined by chemicals released by airbags that deployed when we were hit by a car that lost control on a curve and smashed into us in our driveway. After we were released from the ER and taken home, I had to put my perfect coat in a garbage bag. I was so overjoyed when I found it on overstock, I almost cried. There were no more available at the store where it was purchased, another location of that store, or on their web site. I was soo upset. Thought I'd never find it again. Can't wait to receive this coat. It will make me feel a bit happier as we recover from our injuries. THANKS OVERSTOCK !!!!! I bought this for Mother for Christmas and she loved it. Very beautiful and high quality. Best of all it is faux fur. This coat is beautiful. It is snugly and warm and soft like a big silk lined high quality fleece blanket. People like to hug me more when I wear this coat. I get so many nice compliments. The length covers my back side and keeps out the icy Dakota winter wind. The cuffs are nice and long and keep my wrists and hands warm with light gloves. It is roomy and allows bulky sweaters underneath. I really like that it doesn't constrict my middle so I can get in and out of my Jeep without a struggle. I wore it constantly last winter and it still looks brand new. The only special care I did is that I removed the toggles before I washed it once then sewed them back on with sturdier thread. Easily one of my most favorite things and an excellent buy. Love the coat !!! Very nice looking coat . I'm glad I bought the coat. THE COAT IS BEAUTIFUL ! VERY COMFORTABLE AND WARM. I AM VERY VERY PLEASED WITH THIS ITEM ! I purchased the same coat previously. However I have lost over 40 pounds and the one I have no longer fits. Everywhere I go I receive so many compliments on this coat!! So glad to find it again! Reasonably priced and comes in my size which severely limits items of choice. I need a coat that is large enough anprotection. Color and print were exactly what my mother is seeking. Beautiful! "do you have size small or medium?" Hello ginamark1522, I am sorry but we do not currently have small or medium in stock. Thank you for shopping with us. "Why there are not plus size in options?"